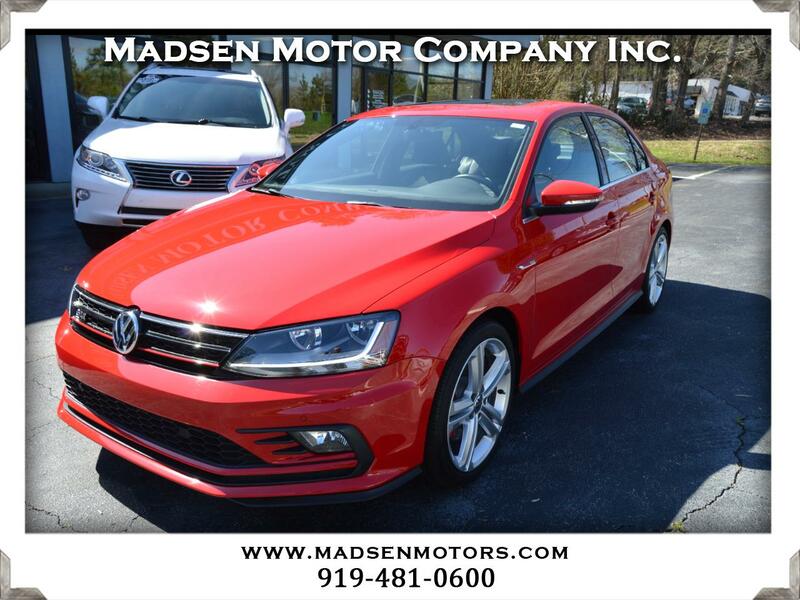 Used 2017 Volkswagen Jetta 2.0T GLI 6A for Sale in Raleigh, Durham, Cary NC 27511 Madsen Motor Company Inc. Here's a stunning, low-mileage example of the top-of-the-line Volkswagen Jetta 2.0T GLI in Tornado Red with Black Leatherette interior! This nearly-new car comes with the 210-HP Turbocharged Engine, 4-Wheel Independent Sport Suspension, and the quick-shifting 6-speed DSG Automatic Transmission with Tiptronic and Steering-Wheel-Mounted Paddle Shifters and lots of extras including 18" Alloy Wheels, Rearview Camera, Navigation System, Blind Spot Monitor with Rear Traffic Alert, Fender Premium Sound, Bluetooth Connectivity, App-Connect Smartphone Integration, Dual-Zone Climate Control, Heated Front Seats, Power Tilting and Sliding Sunroof, and much more. It comes with a clean, 1-owner CARFAX history and the balance of the VW New Car Warranty until 2/24/2021 or 36,000 miles, whichever comes first, and the VW Powertrain Limited Warranty until 2/24/2023 or 60,000 miles, whichever comes first. Buy with confidence from Madsen Motor Company - voted ''Best Pre-Owned Car Store'' 4 years in a row in the Best of Cary awards!